"E pur si muove! ": Ban Big Ammunition Magazines? The other day I posted about something I call the weapons line drawing problem: Some weapons or weapon features or accessories should be banned, and some should not. This means the real question is, where to draw the line? What is the principle that separates the permissible from the ban-able? The principle I offered was "the ultra-hazardous weapon principle": A weapon, weapon feature, or accessory may be banned if it cannot be used safely. The idea is that if you are using such a device, it is too likely that you will eventually be subjecting those around you to an unreasonable level of risk from which they gain no benefit. Since you have no right to do that, banning it would not violate your rights. Clearly, such a ban is not supported by the ultra-hazardous weapon principle. 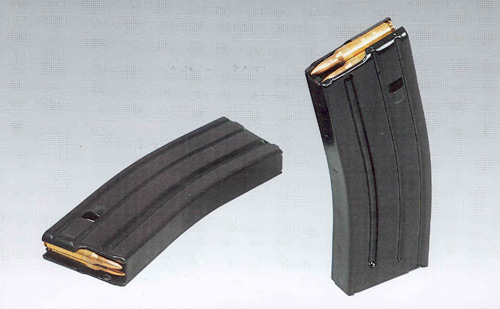 It is easy to use a large magazine safely. Millions of responsible citzens use them on shooting range and (where legal, I hope) for hunting with no one getting hurt. But notice that my principle only rules things in as candidates for banning -- it "may be banned" -- and doesn't rule anything out. Maybe large magazines may be nominated as candidates for banning on the basis of some supplementary principle. One reason I have seen given by talking heads lately as a reason for banning these things is that they "serve no legitimate purpose." I have some sympathy for this a s a general principle. The intuitive idea, I guess, is that such a ban would interfere with criminal acts and, though it would coercively deny the object to innocent people, the coercion involved does them no harm. I'm not generally keen on coercing (ie., threatening) the innocent at all (it violates the libertarian side constraint), but it if does them no harm, I'm at least willing to consider it. There is another problem with this principle, though. It's not so easy to think of an object currently in use in the civilian population that has no legitimate use for which it lacks perfect substitute. Some years ago, I was working on a paper on gun owners' rights (this one) and I tried to propose an example of a weapon that would fail this test and could well be banned: in fact, it already is more or less illegal throughout the US. The example was sawed-off shotguns. This weapon, I said, emits a spray of projectiles, any one of which can cause a nasty injury, and cannot be controlled very well by the shooter (I could have argued just as plausibly, or implausibly, using the ultra-hazardous weapon principle, but I had not thought of it yet). Anyway, my editor for that paper, Samuel C. Wheeler, pointed something out to me. This weapon could be very appropriate as an answering-the-door gun for an elderly gentleman who, say, lives in a dangerous neighborhood (it's the best he can afford) and has had his Social Security check stolen and been mugged, and so has legitimate concerns about his safety. At close quarters, like ansering the door in and apartment building, the projectiles can be controlled quite well enough. Plus, the pellets will not pass through the opposite wall of the hallway, injuring the innocent. I deleted that part of the manuscript. Another problem with the "no legitimate purpose" principle: grading or ranking purposes. After all, there is one legitimate purpose that is served by a big magazine, and there is no conceivable substitute: reloading avoidance. Not having to reload so often. Nothing illegitimate about that. Obviously, the principle has to include a qualification about how the purpose has to be "important" enough to qualify. Maybe the fact that it serves mere convenience is not enough. I don't know about you, but I'm still enough of a liberal to get queasy about deciding whether a purpose -- someone else's purpose -- is "important" enough to exempt them from heavy fines or a jail sentence. It is something the law has to do from time to time, but I would like to keep it to a minimum. Finally, to get back the the big magazine issue itself: I believe these things do pass the "no legitimate purpose"test." To see why, take a look at this compelling essay by history professor Clayton Cramer. You'll see that not having to reload can make a life or death difference in situations that civilians do find themselves in from time to time. Indeed, this feature might be more valuabe to the law-abiding than it is to mass shooters. Further, not only can they save innocent lives, but they can even enable you to safely spare the life of your assailants. If that sounds impossible, just read the essay. Please. On a somewhat related not, here is a very interesting post by my old friend, philosophy prof and sci fi aficionado Kevin Hill. Why Can't These People Say "Christmas"?